This is the more affordable version of glass crafting. Although it doesn’t have the distinctive three dimensional look, this technique is widely used in countless projects. There are two main techniques that are used for glass frosting. 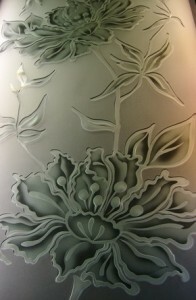 These are Sandblasting and Etching. Etching is a process where acid is typically used to create patterns in the glass while with Sandblasting, high pressure air mixed with an abrasive material cuts away at the glass surface to create the effect.